This entry was posted in autistic, compulsive, obesessive, Parenting and tagged Autism, obsessive compulsive, OCD. Bookmark the permalink. I particularly liked the analogy to a skipping record (maybe because I’m old enough to remember vinyl!). The feeling of being stuck is central to my experience of OCD, as is the illusion that acting out on the obsessive/compulsive impulse will magically extinguish the fire in my brain. The truth is, “obeying the command” only pours more gas on the fire and keeps me stuck. I don’t know if this qualifies as annoying advice-giving, but the most useful suggestions I’ve found dealing with OCD are from the book “You are Not Your Brain” by Jeffrey Schwartz and Rebecca Gladding. Nope not annoying in the least, actually quite lovely. The one thing I see about OCD and the more garden variety obsessiveness I was describing is the idea that if I do this thing all will be okay, or the magical thinking aspect of OCD that I’ve read about, such as hand washing and that if I don’t do it, I’ll die… though now that I’m writing this, I see how addiction is EXACTLY like that. If I don’t take X substance, I will die. This was certainly my experience anyway when I was active. But now it’s (as you well know) that mind set that cycles through a thought, maybe I can even calm the thought, only to find another equally upsetting (or even more upsetting) thought and on and on it goes. I agree completely that the “If I don’t have it, I will DIE!” feeling of addiction compulsion is very, very similar to the “If I don’t DO it, I will DIE!” feeling regarding an OCD compulsion like hand-washing or completing any similar ritual. Thank you, Emma, for suggesting this topic, and Ariane for taking up the challenge. For me the compulsions can range from very wonderful (hyper focus on something I love to do, to look at or to read) to the kind of late night mental lashings you describe. For the middle-of-the-night ratcheting up I have a strange but effective strategy – I play anagrams in my head. I pick a word (7 letters or more) and find all the words contained in it. It seems I don’t have enough room to worry and play with words at the same time. Probably wouldn’t work for everyone, but it mostly works for me…and, of course, it helps that I’m also quite obsessive about anagrams…lol. Oh my goodness I am SO going to try this!! Thank you, thank you for sharing this. Seriously I’m so excited and fascinatingly enough this is a version of something Soma Mukhopadhyay suggests as a way to work through upset before it becomes a full blown melt down. She talks about using mathematical equations as a way to bypass that part of the brain that is clinging to emotional upset. She explains it in far more technical detail than I am able to. Thank you again Emma for sharing your anagram strategy! I love it! Very good…Emma is coming into her own, but now you can focus on you…oh no. I have had periods in my life with these thoughts that wouldn’t stop–I found for me they were usually when I was trapped physically inside myself at a higher level than what I was previously trapped when completely voiceless–does that make sense? Along the same continuum for me…I am freed of them when I can physically breathe through. That being said–breathing is not just something one can do, because they overthink it for one, but the other is my body must be light and have space to breathe through. For me I had to change my way of eating and exercising 20 years ago, and my chemistry eventually followed. I still have those issues in the winter time if I am up north–don’t ask me why 3 degrees on the earth’s surface makes that much difference, but I literally did not have these problems for the three years I spent down on the border of Mexico! “Very good…Emma is coming into her own, but now you can focus on you…oh no.” Ha! Exactly!! “I found for me they were usually when I was trapped physically inside myself at a higher level than what I was previously trapped when completely voiceless” – Can you explain this more? My daughter has typed that she can sense others, but must “sync” with them for true understanding to occur. Is this similar to what you’re saying? I have found the process suggested by Byron Katie – The Work – has been phenomenal for me. It breaks down the belief that is behind the thought – nipping it at the source. I would really suggest doing it with a certified practitioner the first few times. It seems simple on the surface but has a lot of depth to it. Have you heard about EMDR? It sounds a little similar, except that one does not do it to oneself, it is done by a therapist and is used for PTSD and trauma. I found it extremely helpful at a certain point many years ago. After teaching Adaptive P.E. for 7 years and raising a daughter with Trisomy 21, my fourth child, I had an intellectual aha moment. Upon observing so many children over the years, all so different from one another, it occurred to me that there are a few aspects of human behavior we have totally missed. The first is that the brain is an instrument of threat detection. We have 5 senses mainly so that we will be one hundred percent sure of detecting threats in our environment. We are supposed to obsess over potential anomalies in the environment. I have to get my daughter ready for school, and I have more observations to write about but can’t right now, but it has helped me tremendously to understand my brain for how it works for me and not against me as we are indirectly and directly taught our whole lives. One more nuance is that every single anomaly in my environment or experiences, no matter how small or insignificant will cause my brain to go into an anxious state in order to alert me to potential danger. Accepting my anxiety cues as my allies instead of my enemies has helped me put anxiety into perspective. I am way calmer than ever before and I am much more accepting and calm when other people are having anxiety because I understand it now. We have been taught that we have to control our anxiety. That is like asking us to control what our eyes can see. It makes no sense. Anxiety exists to help us maintain control of ourselves in our environment and is as important to our well being as all of our senses. “Accepting my anxiety cues as my allies instead of my enemies has helped me put anxiety into perspective.” Wow! I really like this idea. I have no idea how one puts this into practice, specifically the actions one takes or doesn’t take, but I love the idea of this. Very profound insights Karen. The conceptual framework of brain/mind as “threat detection system” focusing on environmental anomalies if a terrific way to view the phenomenon of OCD. Thank you for sharing this, Ariane. This is the most accessible description of OCD I’ve encountered and helps me understand the condition. While I don’t experience obsessive thoughts I do frequently feel compulsions. As far as I can determine this is related to my autism: it’s something I’ve seen reported by several other autistic people. A prime example is needing to line things up, to arrange items in a particular order. I’ve never found this disruptive enough to my life to seek a way to reduce it. Hi Alex! Always love hearing from you and reading what you have to say. I was a compulsive liner-upper of my toys as a kid Alex, and will still arrange objects “aesthetically.” Today my OCD (outside of purely addictive impulses) is mostly about similar object arrangement issues (there must be ORDER in the universe! And symmetry dammit!). A particularly odd and annoying OCD fetish of mine is composing paragraphs so that the final line doesn’t have one or two words on it, which is called a “leaving a widow” in typography parlance. Not a great habit for a writer to have. Hi Richard! Yes, symmetry and sequences, creating patterns. The sense of order is calming. And I have to add that I do find widows (and orphans) aesthetically displeasing: I understand why typographers arrange paragraphs to prevent them. Your blog is great. Thank you for sharing your experiences, feelings and thoughts. I learn a lot from both of you as mom of Paulina and also as a Human Being. Often I translate parts of Emma thoughts and feelings and Paulina agree with Emma in many ways. Thanks for saying hi Martha. Hello to you and Paulina! Thank you for all your sharing on this blog! I am a special needs teacher and have benefited much from your writings. Can I ask Emma what does she mean ” self talk can be so brutal and cruel”? Emma didn’t write that, I did and what I was referring to is a specific kind of inner dialogue that is essentially an endless critique of oneself. It is relentless, hyper critical and very, very cruel. My way of reducing anxiety is to train my mind to turn anxiety into calm. Whenever I feel anxiety taking over, whenever the obsessive thoughts of something bad happening to my family flood my brain, I stare at swaying treetops, sunrays through branches, and blinking lights, and try to lose myself in it in complete fascination. Maybe it time I’ll learn to tame my anxiety. Just started weeks ago, and my anxiety seems to get a bit better, or maybe it’s just the placebo effect. I can relate to this, nature definitely helps. My biggest challenge is that the anxiety usually floods my brain in the middle of the night. Staring at the ceiling doesn’t have the same effect. Thanks. Anxiety can be a beast…I understand the skipping record. Sometimes I feel like I fall into a hole and must claw my way out, and will step on others to do so. I hate that. As much as my brain says, “You’re being ridiculous” I keep fighting it with words. Yesterday I worked through an episode. (It took hours). I finally started cleaning obsessively and actually felt better. I wonder if that is why some people have such clean houses, such busy lives. It fills up the hole without throwing anyone else in there. It’s interesting, we do so much gazing toward our children. Maybe it gives them a break to gaze into out own navels every now and again.Thanks to the Emma, also, for the idea. Cleaning obsessively! I forgot about cleaning, the great elixir of anxiety!! This really resonated for me. I’ve been a “pure O” for most of my life and it’s as much a part of me as my autistic traits so I never really found it difficult to cope with, just very unpleasant and disturbing when a thought arises. Recently some compulsions have started to pop up and the only way I’ve found to cope with them is to strong arm them into submission or give in. Is there even a middle ground with this stuff? I like your timer idea but my compulsions are so benign (if time wasting) that it’s probably faster to just write the damn list over or whatever, than to spend cognitive resources on resisting an especially strong compulsion. I have struggled with anxiety for as long as I can remember, and as the water flowed under the bridge with mounting episodes, so the anxiety quickened. Eventually last year my brain became permanently stuck in that spiral into terrifying darkness, barely surfacing before plunging completely out of control again into depths so dark I could no longer function. The worst was that I could not even identify thoughts causing the sudden spiralling. I then started paying attention to the words I had just heard. One word I remember was ‘old’; just hearing the word or even seeing an old person, dropped me instantly into the abyss. NOTHING I had learned before was working, from distraction through meditation. I finally HAD to admit I had lost the battle and needed help. 1. The psychologist (specializing in trauma – I had open-heart surgery when I was 4 and to this day remember the terror – long story) told me that the GOOD news was that it is ONLY anxiety! I repeat this to myself over and over to this day when necessary – no longer that often. 2. I needed to ground myself to convince my brain of this fact, i.e. that the thoughts are not REAL and that there is therefore no need to send messages of pending doom to every single part of my poor body. The way to achieve this was by FEELING surfaces against my skin, reaching out and rubbing surfaces actively with any part of my body possible, cool sheets, walls, couches, anything, until the spiral subsided. This works surprisingly well for me! 3. But there was one obsessive thought that turned out to be the sub-conscious driving force of all the now out of control insanity, and it was time to let that skeleton out of the cupboard, the one thing I swore I could never tell anyone other than my husband, the one thing that made me feel a total failure as far as my daughter was concerned, which for me meant failure in life itself. A move I will never regret! The psychologist was able to give me the knowledge I needed to assure me that the guilt I was suffering was not a burden I needed to shoulder any longer. She was able to do this because she had experience over 30 years that no amount of literature thus far had been able to give me. Please, if anyone has a skeleton, seek help! Skeletons seem to push those of us prone to anxiety over the edge. Agreed. Skeletons are awful. The shame that inevitably comes with them take up a massive amount of space and energy. Glad you took them out of hiding. I really love what’s happened here with this thread, and I’m thinking we need to do more of this. There are so many unexplored strategies (and wonderfully quirky ones) that we can share. So much of the dialogue is about remediation – this is refreshing, challenges the usual approaches, and above all is potentially useful. Thanks. Emma – I completely agree!! One strategy I am trying now (speaking as an autistic adult) has been to try to write and write and write to find out what is at the center of that obsessive/anxiety cycle that keeps the wheel turning. Unfortunately for me, it is PTSD, but I’m finding that while talk therapy has helped with a lot of my anxiety (fortunately my choking phobia as somehow burned itself out, thankfully) so I am going to be trying EMDR. Good luck! It is hard work but it is good work. I remember vividly, the day I discovered Obsessive Compulsive disorder was a “thing”. I was mindlessly passing an afternoon in a book store 23 years ago. I was young and on my own in a big new city. A title caught my eye, “The Boy Who Could Not Stop Washing”. I remember thinking “That’s weird. What does that even mean?” I don’t know if it was because society wasn’t as aware then of disorders or if I just wasn’t aware, but I had no idea that what I had been living with my entire life was a “thing”. I didn’t have the washing compulsion so I opened that book with a kind of morbid curiosity. I hadn’t expected what I found. It was like my whole world suddenly made sense. I remember, as a child, constantly being nagged for being late or running behind. My parents had no idea it was because I COULD NOT leave my room until my stuffed animals were arranged just so and kissed the exact number of times “required”. If I was interrupted, I had to start all over. I remember the stress and panic, knowing I was going to get in trouble but being helpless to stop myself. So here I was in this new city, utterly exhausted from a whole new set of triggers that were compounding. I couldn’t shower unless I had hours to accommodate the number of times I had to turn around in there, touch the faucet, doors, light switches, threshold crossing. Gah! There was a set number of times these had to be done, and as it got worse, done “correctly”, or I’d have to start all over again. That was just the shower. It applied everywhere though, home, work, shopping, walking. I really thought I was losing my mind. That’s an overused phrase, but it couldn’t be more true. Call it fate, divine intervention, I don’t know what, but I cried with relief right in that book store as I read that boy’s story. I found a psychiatrist who worked with low income people and I didn’t even finish the evaluation before she diagnosed me. I began taking a medication I can’t recall any longer and it truly changed my life. I am terrible with taking meds but I kept it up for a year before weaning myself off. It came back in trickles, but somehow I could manage them better. I became very good at bargaining with myself over them and prioritizing them. Today, they are still there. They are worse when I am under stress, and kind of a minimal intrusion and mindless part of my routine when I’m not. They are a part of me that I have come to accept and try to accommodate for when necessary. When they are moving towards out of control, I have to stay VERY busy. Unlike when I was a child, interruption is now welcome, as it snaps me away and I let it go until the next time. 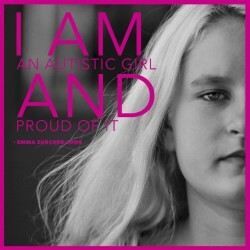 I’m pretty sure KA (my daughter) being autistic and the unbelievable autistic people I’ve befriended, who embrace their neurodiversity, have helped me realize that I can accept this aspect of myself. Even if it’s not “normal”, even if it’s sometimes exhausting, I can accept it and accommodate it. That’s given me great peace. Michelle, thank you so much for sharing this! It is so, so helpful. We are! We really are. Best decision we ever made. I have similar ways of getting through times of compulsive thoughts. Foe me, being outside breathing fresh air, being alone, meditating, and focusing on the world around me, rather than the scary world inside me, help me get through. I like the idea of learning something new and might try that. It is a productive thing to do that I enjoy anyway so I might as well! Thanks for writing and thank you Emma for suggesting it:).